Here are some of the highlights of our recent log salvage adventures. I call them “adventures” because it would be much easier to chunk the log up into firewood and throw it in the back of the truck, but who likes to take the easy road? Although salvaging the trees we cut down can sometimes be an onerous task, it is a huge honor to turn the trees folks are “throwing away” into beautiful pieces of heirloom-quality furniture to be enjoyed for generations. We are proud to undertake this work. This photo below shows a white oak log we had to cut in half the long way to get it out under a fence and around a house. Jeff from Jeff's Portable Sawmill and his brother came out to rip the two logs in half and we loaded them up on his trailer for further processing. Jeff has retrieved many of our logs and turned them into huge slabs, decking, and dimensional lumber. White oak log being cut with a portable sawmill. There are endless uses for urban salvage wood if you are willing to put the extra effort into finding what you need and then likely paying a bit more for the material. After all, salvaging a log in a backyard is a lot harder than clearing a forest! In my mind, urban wood has a lot of interesting character to it and is worth the extra cost. The next image shows a red oak log from a property off Nakoma that Jeff is milling into slabs. This tree was a perfect specimen with no structural issues whatsoever, but it died a quick death due to oak wilt. While it is sad to see perfect trees die quickly without warning, I am glad to see salvaged pieces put to good use. While writing this I returned to the yard and found Jeff and the gang milling the logs. They managed to get 15 gigantic slabs from the trunk. They were 12' long, 3-4' wide and 3.5" thick. Lumber this large can easy become a handsome dinner or banquet table for a very large dining room! Milling red oak slabs salvaged from a fallen oak tree. The stack of lumber below is another project we worked on with Jeff on the outskirts of Fitchburg. My daughter couldn't resist being in the photo, she is on top of a stack of oak and walnut boards. The client had a couple standing dead trees and a couple other walnuts that he wanted to thin out. We were able to do all the removals on a Thursday and by Saturday night, Jeff had it all milled and ready for drying. We are not always this efficient and timely, but sometimes the stars align. Milled oak and walnut boards salvaged from a client property in Fitchburg. Lastly, pictured below is a stately white oak that perished in the Monroe Street neighborhood. Garrett is in the tree making the final cut to get the tree to a safe height to fell. Once on the ground, we could see the trunk base had a little rot, but nothing too bad considering the log was around 40" wide at the base and over 20' long! This seemed like another excellent candidate for salvage and we were able to get a number of large, healthy planks of wood out of this tree. Garrett takes down a sizable oak tree off Monroe Street. The people salvaging urban wood are important players in helping us create greater connections to our trees. When logs are diced up for firewood, we miss out on all those awesome tables and desks made from one slab of wood! 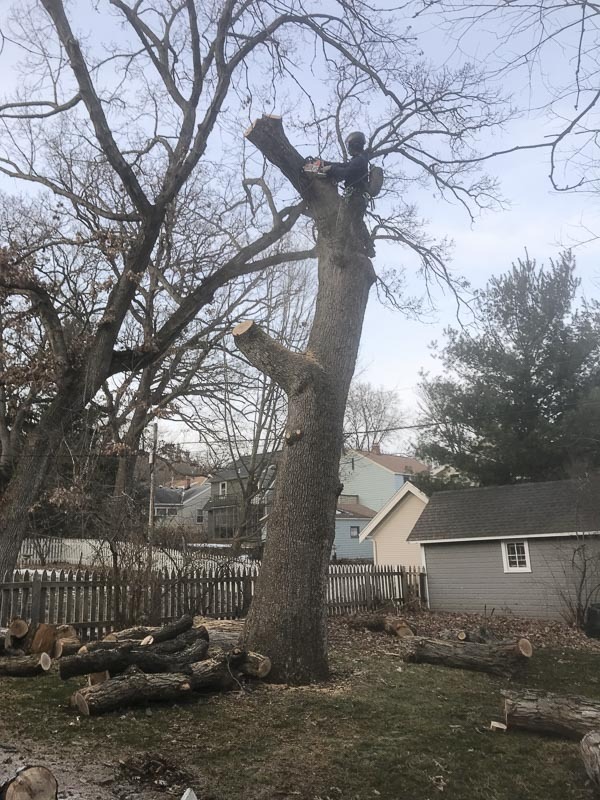 While many tree services would rather get a tree out of a yard the fastest way possible, we think it's wasteful to simply cut big, old trees into chunks, to be burned as firewood. We are interested salvaging urban-sourced trees in the most responsible manner possible, even if it takes some (often a LOT of) extra effort. This last photo is our clutch of logs from the winter. Amongst them, you will find oak, ash, elm, spruce, pine, maple and hickory trees. Believe it or not, we do more pruning than removing on an annual basis but even when you don't focus on removals you end up with a lot of logs! Oak, ash, elm, spruce, pine, maple and hickory logs. If you are interested in purchasing salvaged urban wood for a project, there are a number of places you can look in Madison. The Wood Cycle of Fitchberg hauls and mills logs that end up for sale at Habitat for Humanity Restore on Monona Drive. Jeff's Portable Sawmill also offers salvaged timber slabs and lumber as well.